One of the many great things about WordPress as a platform is the continual improvement each and every year brings. The core software today is barely recognizable from even five years ago, and the pace of change is only getting faster. Plugins are obviously at the core of much of that improvement and 2015 has been a bumper year in that department. As we approach the end of the year, it seemed like an excellent opportunity to pick out the plugins which have really stood out for us so far. We’ve broken up our 14 picks for the best WordPress plugins of 2015 into three categories: classic plugins which have once again raised their game, new arrivals which have made a splash, and sleepers which are currently flying under the radar but deserve a shoutout. Let’s start with some old friends who’ve received a fresh lick of paint! We’ll kick things off with a selection of classic plugins which have continued to set standards for excellence in 2015. Each of these has enjoyed considerable success to date by offering rock-solid solutions, and continuous feature improvements, over the course of their development. They span the spectrum of what you can be achieved with WordPress and are go-to options for most WordPress developers. In all cases, they’ve upped the ante once again in 2015. SEO is still a subject of some mystery and fear for many site owners, but WordPress has enjoyed a well-deserved reputation for excellence in that department since its early days. The longstanding availability of purpose-built tools such as the Yoast SEO plugin has played a significant role in that. Creator Joost de Valk has been helping developers with their SEO problems since 2008 and, with over one million active installs to date and a 4.5 star satisfaction rating, it’s hard to argue they’ve done anything less than a standout job in that time. The popular plugin received significant updates in 2015 which kept it at the top of our must-have list. Long-term Yoast SEO users will remember 2014 as a landmark year with the release of the 1.5 version of the plugin. 2015 has seen equally important updates as Yoast SEO finally hit 2.0 at the end of March and continued to iteratively improve thereafter. Highlights included the addition of Google Knowledge Graph integration and simplified admin menus in the free version of the plugin. The premium version of Yoast SEO also saw significant speed improvements and the addition of 13 new training videos from Shawn Hesketh of WP101. As a high-profile WordPress plugin, Yoast is a natural target for the shadier elements of the internet and the team has continued to stay on top of security issues throughout the year. They’ve also continued to improve the plugin’s security by regularly fixing bugs and vulnerabilities and are planning to release real-time content analysis by the end of the year. Regardless of what kind of WordPress site you’re running, SEO is always going to be a key concern and Yoast SEO has more than earned its place at the top of available options in that area. If you’re looking to compare it against some serious competition, other plugins worthy of mention are SEO Ultimate and All in One SEO Pack. Improvements to WordPress don’t have to be dramatic to make a real difference to your day-to-day experience as a user. Sometimes all it takes is small changes to a constantly used tool to save hours of needless work over the course of the year, and dramatically improve your overall enjoyment of WordPress. With its intuitive customization features and fine-tuned control options, that’s exactly what the TinyMCE Advanced plugin offers. This plugin has grown from being a simple add-on to one of the most-installed WordPress plugins with over one million active installs – having greater control over the Visual Editor toolbar is one of the first things experienced WordPress users make sure to enable on new sites. 2015 has seen the TinyMCE Advanced plugin continue to improve on top of various TinyMCE related bugfixes in WordPress itself. With TinyMCE Advanced, you can now create and edit tables directly in WordPress, have greater control over lists, use find-and-replace directly in the editor, and set sitewide controls for font family and sizes via CSS. TinyMCE Advanced is lightweight and easy to install and should be near the top of your list of must-have plugins. There’s a great introduction to its wider functionality over on Pagely. If you’re interested in getting even more out of TinyMCE, consider using the Black Studio TinyMCE Widget to add TinyMCE to your sidebars. Turning on caching of some sort is a near inevitable rite of passage for every successful WordPress site owner. By optimizing static file delivery, minifying assets and intelligently caching site content, you can make an enormous difference to your site’s loading speed and overall user experience. There are a number of great tools out there to help do this, but the standout candidate is W3 Total Cache. W3 Total Cache has over 1 million active installs and promises at least a 10x improvement in overall site performance when fully configured – a payoff that’s not going to do your Google rankings any harm. It’s also trusted by heavyweight WordPress installs like ilovetypography.com, webdesignerdepot.com, and mashable.com, to name just a few. W3 Total Cache is simple to get up and running with but has more than enough configuration options available to keep even the most technically advanced site performance enthusiast busy. 2015 has seen this plugin continue to boom in popularity and brought improvements in stability and performance across the board. Notable new features include integration with Yoast SEO, additional support for MaxCDN and Cloudflare, and a raft of bugfixes and security improvements. If you’re at all serious about site performance, integrating a caching solution is pretty much obligatory and W3 Total Cache remains the leading contender in 2015. Keeping your WordPress site safe is a never-ending battle and it’s not one you want to go into alone. Thanks to WordPress’s continual updates and enhancements, you can be reasonably confident the core software is secure but taking extra steps to prevent attacks or vulnerabilities from affecting your site is always wise. WordPress sites are perennial targets for hackers so it’s no surprise several excellent WordPress security plugins have emerged over the years. Despite serious competition, Wordfence remains near the top of the queue. Since its relatively recent 2012 launch, Wordfence has clocked up an incredible downloads tally of over nine million. The basic plugin is free and a number of incredibly affordable premium licensing options are also available. It’s definitely worth investigating the premium options – when you consider the potential cost of a website breach, this is most definitely not an area where you want to penny pinch. Wordfence offers a number of unique features in terms of scanning, detection and protection, including real-time blocking of known attackers and advanced measures against bots and automated site scrapers. The Wordfence blog is also a valuable (and regularly updated) WordPress security resource with full details on the many improvements that have gone into the software this year. Site security is not an area where you want to take chances and Wordfence remains the gold standard in terms of taking care of business in this regard. Honorable mention must also be made of the Sucuri Security plugin which is another excellent plugin for locking down your site. CAPTCHA systems have been the bane of internet users for many years. A necessary evil in many respects, they play a significant role in protecting websites from malicious, fake users and the dreaded spambots but, as a user experience, they’ve often left a lot to be desired. Thanks to Google’s reCAPTCHA project, we now have an intuitive solution that can foil bots and not force humans to jump through unnecessary hoops involving blurry text and numbers. 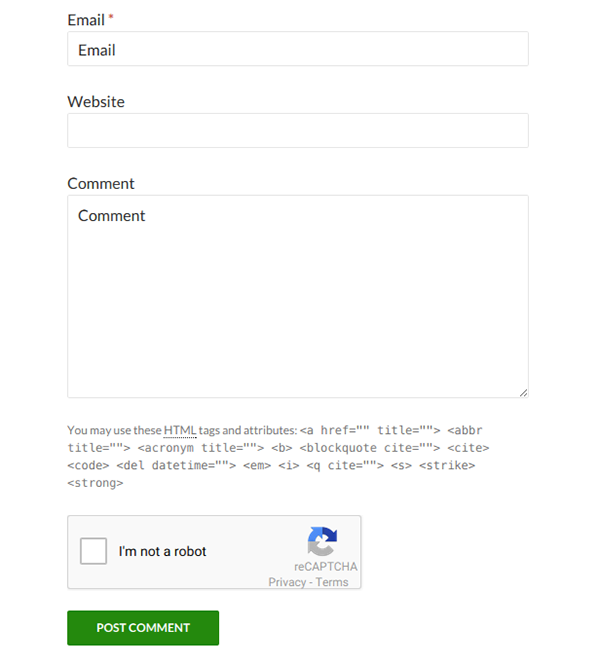 Add easy-to-use reCAPTCHA to contact forms on your website. Better WordPress reCAPTCHA is a newly updated plugin that enables you to integrate reCAPTCHA into WordPress with ease. WordPress has decent options for protection against bots and fake users already, but there are times where you want to go the extra mile. Better WordPress reCAPTCHA does just that and plays nicely with Akismet and Contact Form 7 right out of the box. Install it today and those people trying to contact you via forms on your site will thank you. Keeping regular backups of your WordPress website is vital in terms of protecting both your online presence and your own sanity as a site owner. It can be a frustrating process without the right tools, however. Not all web hosts’ automated backup features are optimized for WordPress either. There’s a variety of backup solutions for WordPress out there in the wild, but UpdraftPlus is the definite front runner. With over three million downloads and half a million active installs, it has a strong claim to be the most popular backup solution around. 2015 has seen significant improvements to what was an already extremely powerful tool. The developers have fine-tuned the back end, allowing for greater control over retention and deletion of files, and introduced custom backup schedules. All the standard features you’d expect are present and correct. You can schedule regular backups of your site files, databases (or specific areas of your website), and cloud support in the form of Amazon S3, Dropbox, Google Drive and others is available. Additional power features include quick restoration of files and databases, a site duplicator (super handy for migrating to new servers), and compatibility with other backup plugins. It even has fail-safe features for when a backup is interrupted due to server spikes. Honorable mentions in this category include BackWPUp, BackupWordPress, and Simple Backup. It’s been quite the year for WooCommerce. The excitement over becoming the latest addition to the Automattic empire did nothing to distract from significant new improvements being rolled out for what is, at this stage, one of the world’s most popular e-commerce solutions. WooCommerce already had a lot going for it prior to 2015 with attractive storefront themes, excellent payment gateway support, responsive design and a huge range of e-commerce extensions available. Even a quick glance at the changelog for 2015 shows that iterative improvement remains a priority with a huge number of tweaks, fixes and features being regularly released. Improvements also continued to be seen on the extensions side of things with version 2.0 of WooCommerce Subscriptions shipping (including support for recurring payments). In a move that could be incredibly helpful for site owners everywhere, a verified WooCommerce developer program was also launched in the form of WooExperts. WooCommerce is simply miles out in front in terms of WordPress e-commerce solutions. If you’re selling anything at all via your WordPress site, it’s unlikely you’ll be looking anywhere else. The heavyweight backing of Automattic makes the chances of that changing anytime soon pretty remote. The first seven plugins on our list are all well known in their respective ways. 2015 has also seen some great new plugins starting to make waves in the WordPress community. Five in particular caught our eye over the course of the year. Social networks pop into life with bewildering speed these days, but there’s no denying who the big boys are. Twitter, despite its recent travails, remains near the top of the tree. There’ve always been various options for integrating Twitter with WordPress but site owners can now finally take advantage of a sanctioned one with the official Twitter plugin for WordPress. Why a tech giant with over 4,000 employees took quite that long to release a plugin for the most popular content management system on earth is a bit of a mystery but Twitter moves in mysterious ways. The newly released Twitter plugin makes embedding Twitter content (which these days includes tweets, Vine and Periscope material) onto your WordPress site seamless and easy. It also provides options for moving content in the other direction – sharing buttons mean you and your audience can quickly post content back to Twitter from WordPress. The plugin auto-generates Twitter-friendly markup that works in their 140 character environment and includes follow buttons which been be easily placed throughout your site. Other standout options include embeddable moments and video, the ability to post multiple tweets in an attractive layout, and analytics for impressions and top users. You’ve probably already kicked the tires of numerous social media plugins over the years and many of them are guilty of throwing in everything but the kitchen sink with their offerings. The official Twitter plugin is refreshingly single-purpose in terms of supported tools but packs a lot of functionality in at the same time. We mentioned this plugin earlier in the year, but if you haven’t checked it out yet, now’s the time. Login Page Styler is a unique tool that enables you to create a custom-designed login page for your WordPress site. The plugin supports custom pages for admin login, client login, registration and password recovery. It requires zero coding skills to use and works within minutes of installing. This tool is great for WordPress sites that want to extend their branding and enables you to create an attractive login page for users that regularly post or comment on your website. Customizing a login page sounds like a small thing to accomplish technically but, as anyone who’s ever tried it without the help of a plugin like this can attest, it can be frustratingly hard to carry out in practice. The simplicity of this plugin means you don’t need to overhaul your entire site or waste hours hunting through theming files. Add it to your arsenal of handy tools. Popup Builder enables you to add slickly integrated popups to your WordPress site and provides an intuitive dashboard for designing and adding them to any page. The free version of the plugin supports images and HTML while the premium version ($9.95) supports iframes, shortcodes and video. The uses Popup Builder can be put to are naturally various, you’re really only limited by your imagination. You can use it to advertise sales on your store, promote a new product, or draw user attention to your newsletter or blog. This one is an incredibly handy option to have in your pocket if you’re doing any sort of work on e-commerce stores. Event Calendar offers a fully-featured solution for adding events support to your WordPress site without disappearing into a vortex of unnecessary custom coding. The plugin enables you to add an attractive, responsive calendar to any page or sidebar. It also includes a widget for a Mini Calendar, provides Google Maps integration, social sharing, and a variety of view options. The plugin is built on WordPress core standards, so it should fit in smoothly with your site as a whole. It’s easy to customize and update and displays perfectly on all devices. A decent range of languages are also supported and the developers offer to include new languages on demand. Events (however large or small) are an important part of the overall online and offline marketing mix for many businesses, so being able to simply integrate them into your site is a huge plus. If you’ve struggled with how to do that to date, your problems may well be at an end. Being able to provide multilingual content is an increasingly common requirement for WordPress site owners worldwide. The standard solution to this has long been the venerable WPML plugin but a new contender has recently emerged – Polylang. If WPML is too intricate (or expensive) for you to consider, Polylang could well be a practical alternative. The plugin interface is available in 41 languages and professional translation help is available via a tie-in with Lingotek Translation. In a huge developer community like WordPress, there are always a few great plugins that slip through the cracks. Although they may not have grabbed headlines this year, two tools in particular struck us as ones that will certainly pick up steam in the near future. Google Analytics is the leading solution for tracking visitor data, but it can be a confusing tool to use. The sheer amount of data available is often overwhelming and it’s easy to get lost in the interface. The Better Google Analytics plugin not only enables you to easily add the necessary Analytics tracking code to your site, but also provides a manageable, real-time Analytics dashboard directly in your WordPress back end. Some of the standout features on offer here include A/B testing without having to custom code, auto configuration of your Analytics account, and seamless integration with WordPress. Installing this plugin is a great way of keeping everything in one place and avoiding overwhelm as a site owner. A pro version of the plugin is also available for $60. As new social networks continue to emerge, there will be an ongoing need to integrate them properly into WordPress. Despite its enormous user base, Instagram is still flying under the radar for many site owners. As we head into 2016, now would be an excellent time to start exploring its power and making the most of it. The AccessPress Instagram Feed is a great way of quickly integrating the platform into your main site. It provides options for embedding your Instagram feed directly into your site and displays images in an attractive mosaic gallery with a lightbox-style overlay for viewing. The plugin is easily configurable with a variety of options from the dashboard. The WordPress developer community never stops learning or innovating so we can expect the next twelve months to bring improvements in many of the plugins we’ve mentioned – and brand new options that haven’t even left the drawing board yet. The amount of incredibly useful, high-quality plugins out there has never been greater, and the upcoming integration of the WordPress REST API promises to usher in a brand new world for site owners and developers alike. Our picks above are naturally based on our own personal preferences and needs over the year, so yours will doubtless vary. We’d love to hear what would make your list of top plugins, though. Is there a particular plugin you just can’t live without? Or a new plugin that’s made it onto the must-have list this year? Get in touch via the comments and let us know! Regarding security, I’ll also add GoodBye Captcha to your list. It is one of the top rated plugins and works like a charm. I really like the fact that there is no captcha on my forms. It’s a premium plugin, but I can’t live without Gravity Forms! I also can’t forget about BackupBuddy either. Those are two plugins that are on every site I build no matter what. I could’nt live without MailPoet any more 🙂 Great plugin to send newsletters automatically, and very simple to use. I note the W3 Total Cache plugin mention. I found it caused conflicts with your Bloom – optin plugin. I’ll be happy to hear that this is no longer the case. I would add duplicator that i’m always using for migration or simple backup. WP Rocket as well for speeding up the websites. I was formerly a devote user of BWP Recaptcha, but last month there was an issue with the Recaptcha ALWAYS failing. After doing some troubleshooting with the developer, he identified a problem with the plugin code. Cool, I thought, but it took him nearly 3 weeks to release the fix. I’m all for the little guy, but I can’t have my client’s sites not working for 3 weeks so I had to find an alternative. Their update schedule is much more frequent (pros of being backed by a plugin development company), and the free version of the plugin is nearly identical in functionality to BWP Recaptcha. I wouldn’t suggest this plugin because it is too difficult for the user to enter what the ReCaptcha is asking for. Ever heard of the plugin Custom Content Shortcode? Just install it and read the documentation in the admin area. You’ll definitely gonna love it! Can anyone point me to plug in that will provide Facebook-like tagging capabilities on Photos in a WP site? I would like for my readers to be able to tag and comment on people in a photo. While that event plugin is solid, a better free option exists: Timely event Calendar. The main reason? Recurring events are included in the free version. If you don’t need recurring events, then the event calendar you posted is pretty good (it is also great if you are willing to pay). It is pretty silly though that they have recurring events behind a paywall. You don’t even need any Captcha with CF7. I use the honeypot add on and haven’t received spam for nearly a year now. elegant theme have any discount during thanks giving? I’ll try W3 Total Cache. Thanks for much information and for making our lives simpler. I always install Revision Control to keep the number of versions of everything kept in the database undercontrol, Black Studio TinyMCE Widget to give visaul editing capabilities to widgets and Gravity forms for easy creation of the most complex forms. A category that we should have in mind are the cookies. I personally use the below plugin but there are many more in the same category. Does the Better WordPress reCAPTCHA fix the Google reCAPTCHA BIG BUG not being responsive? Yes BWS Google Captcha is responsive. It looks fine on my desktop, iPad and iPhone. I’m not so sure about those recommendations for Duplicator/Duplicator Pro. I used Duplicator Pro to backup/migrate a number of sites and, in every case, the Divi Library export function failed to work in the duplicated site. This is Joe from UpdraftPlus. According to our developers there’s never been a problem with Divi Library in backup or migration – Divi is the hottest theme at the moment, so it’s important you get an advanced backup plugin that can handle all aspects of it. As we’re installed on half a million sites, it’s been tested on Divi quite a lot. One thing to look out for is if you are using any caching plugins. In this case, it can help to disable this type of plugin and clear the cache before migrating. very advanced technical writing ,full of detailed information and very will linked to each other. Glad to see you are promoting this Events calendar plugin.. we just started using this on our nursing home website but haven’t launched it quite yet. Seems to be a great alternative to the Modern Tribe events plugin that doesn’t work as well with Divi. Thanks for the great info! I’ve been using iThemes security for quite a while now and it is pretty robust and easy to use, what do others think of this plugin as compared to the competition? EasyIndex plugin does a great job creating indexes of my categories and posts and it’s available at > https://wordpress.org/plugins/easyindex/. The plugin indexes categories, tags or other taxonomies. It’s possible to make an index by hand but the advantage for me is that I’m a blogger not a coder and this allows me to change the layout, format and content of my index, choose whether I want a text or photo index or even if I want excerpts or not. I found visitors were finding heaps more of my older content than before I had the index. For translation, I find Transposh to be a better solution than the others mentioned here (which I’ve both tried). Also for backup, I prefer BackupWordpress and install it in all my sites. For email address obfuscation, I really like Cryptx. Since Yoast SEO tops your list, you might want to consider including my SO Clean Up Yoast SEO, which has seen an immense download (and active installs) rate since we released it earlier this year. Furthermore I think that Gravity Forms should be on the list and Advanced Custom Fields. A good (and free) alternative to WP Migrate DB Pro is WP Sync DB, which is available via Github. I am looking for a plugIn or a way to create the simplest Email Signup Form / Optn Form. What Divi has as a default is too bulky. 1 – a free plugIn that would be able to do it. 2 – MailChipm form is functional but doesn’t look at all. What is the best way to go about it? Could you, please, make a recommendation.